Transit • Ceremonial events herald Sunday's official openings. Al Hartmann | The Salt Lake Tribune Kent Money, South Jordan Mayor, speaks at Daybreak Parkway Station for Trax kickoff ceremony Tuesday at Daybreak. Al Hartmann | The Salt Lake Tribune Folks exit a new stepless TRAX train Tuesday onto the new West Valley Central Station platform after riding from the Daybreak Parkway Station in South Jordan as part of a two-part grand opening ceremony for both stations. The new lines open for commuters Sunday. 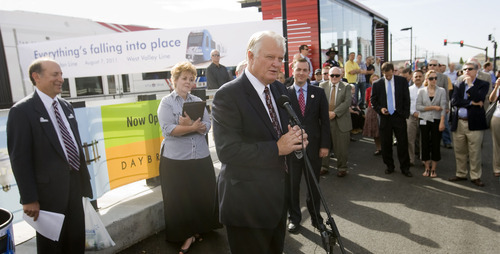 Al Hartmann | The Salt Lake Tribune Michael Allegra, General Manager of Utah Transit Authority, left, speaks at opening ceremony at the West Valley Central TRAX Station Tuesday. Seated down the row are: Greg Hughes, chairman of the UTA Board, William Millar, president, American Public Transportation Asociation, Lane Beattie, president of Salt Lake Chammber of Commerce, and Mike Winder, mayor of West Valley City. 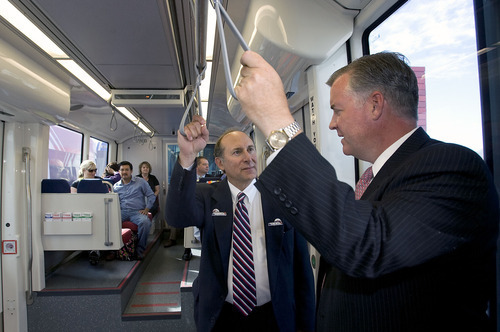 Al Hartmann | The Salt Lake Tribune UTA General Manager Michael Allegra, left, talks to Salt Lake County Mayor Peter Corroon as a new stepless Trax train leaves the Daybreak Parkway Station after a ceremony Tuesday at Daybreak. The train continued up the line to the West Valley Central Station. The new lines open for customers Sunday. Al Hartmann | The Salt Lake Tribune A new stepless TRAX train breaks through a banner to open the Daybreak Parkway Station during a pre-kickoff ceremony Tuesday at Daybreak. The train contiued on to West Valley City to open the West Valley Central Station at 3650 South 2800 West. 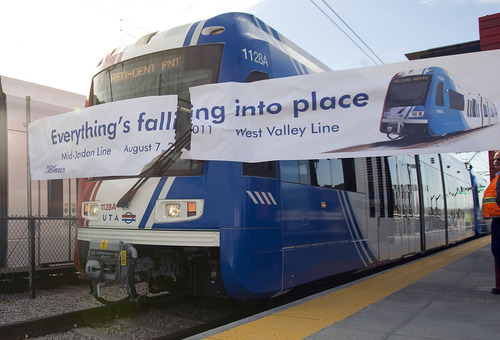 Five days before the actual start-up, dignitaries staged inaugural ceremonies and rides Tuesday on the new West Valley City and Mid-Jordan TRAX extensions  cutting the ribbon by sending a new train speeding through a banner that proclaimed that "everything's falling into place." UTA General Manger Michael Allegra said that's a good theme for the opening of the lines. "They are being completed a year ahead of schedule and about 20 percent under budget. … It is a very wonderful day." Actually, he said completion is more like 20 or 30 years quicker than he once thought. Allegra said when UTA bought rail right of way nine years ago, "we figured it was for maybe 2030 or 2040 at the earliest, and never dreamed this would be completed so fast." But it was sped up by residents approving a quarter-cent sales tax increase, arrival of federal stimulus money and even local developers adding money. That has also helped quicken other under-contruction TRAX extensions to Draper and Salt Lake City International Airport (both expected to open in 2013), and an extension to Provo of the FrontRunner commuter rail, expected in 2014. When the two new TRAX lines open permanently for business on Sunday, Allegra said UTA believes it will be the first time that any transit agency in America has opened two new major light-rail lines at the same time. They will more than double the number of train cars operating and nearly double overall TRAX mileage. The $535 million Mid-Jordan TRAX extension runs 10.6 miles from the Daybreak area of South Jordan to Murray. 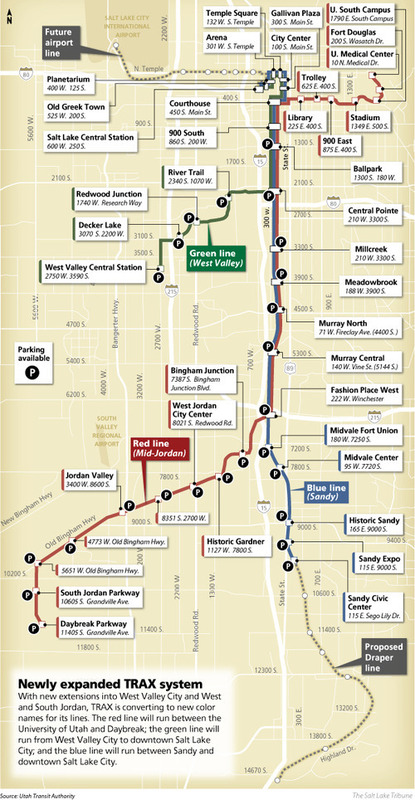 It will form part of the new red line that will run from Daybreak to the University of Utah. It is expected to carry 9,000 people a day initially. 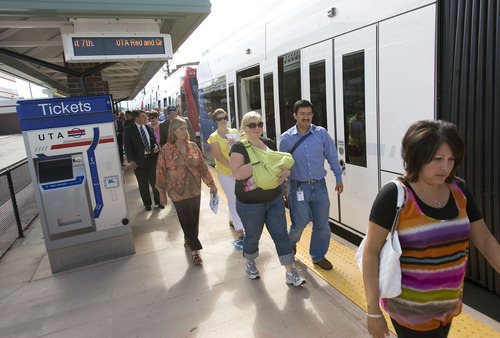 The $370 million West Valley City TRAX extension runs 5.1 miles from Valley Fair Mall to the Central Pointe Station at 2100 South. It will form part of the new green line that will initially run from West Valley City to the Salt Lake Central Station. That green line eventually will run to Salt Lake City International Airport. Officials estimate that it will carry about 5,000 people a day at first. What will be called the blue line runs from the Salt Lake Central station to Sandy now, and eventually to Draper. Operating all the trains comes at a cost. UTA is cutting its bus offerings by 10 percent, also effective on Sunday, to fund the new TRAX lines. But it says its overall system will carry more people, and bus lines have been reconfigured to take many bus riders for transfer onto TRAX. The UTA held ceremonies Tuesday both in South Jordan and West Valley City to celebrate the new lines, and ran a special inaugural train between the ends of both new extensions  with a standing-room-only crowd of local mayors, City Council members, legislators, business representatives and officials from UTA, the Federal Transit Administration and some invited residents. "I am grateful to the citizens of Salt Lake County who got behind this," said South Jordan Mayor Kent Money. He said when he first saw long-range plans for the rail lines, he thought they "would die a slow death because we didn't have funding for them"  but the community supported raising needed money. He said the TRAX line is already helping attract new businesses and residences to his community. For example, Don Whyte, president of Kennecott Land, said his company donated $13 million in land and money toward the Mid-Jordan line, viewing it as a boon to its Daybreak development in South Jordan. He said the line will also help reduce air pollution. "If we're really going to have an impact on air quality in Salt Lake County, it's with projects like this that take cars off the road," Whyte said. West Valley City Mayor Mike Winder said he views the new TRAX stations in his city as a "string of pearls" attracting new development around them, including at what the city calls Fairbourne Station at the end of the line. He says it will have a half-billion dollars worth of development, including a new seven-story hotel that is under construction. Residents can ride the new Mid-Jordan and West Valley City TRAX lines free Wednesday  or almost for free. Fare at any new station  for one day only  is a nonperishable food item for the poor, which will be collected for the Utah Food Bank. Donors will be given a sticker good for unlimited travel all day throughout the TRAX system. The food for fare offer begins at 9 a.m. and runs through 11 p.m. The South Jordan Parkway Station (10605 S. Grandville Ave, South Jordan) will not be open for public rides on Wednesday because of some final construction. No rides on the new lines will be available Thursday through Saturday. The new lines open permanently to the public starting Sunday.